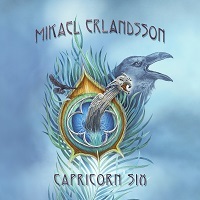 Mikael Erlandsson is back with his sixth solo album “Capricorn Six”. The Swedish singer is a true Aor/melodic rock legend that with his amazing voice which has been one of the best in this genre for more than 25 years. Erlandsson had success in Sweden already in 1990 when he was the frontman in the band N´GANG where he had several hits including a Swedish song in the Eurovision Song Contest. The breakthrough in the Rock scene happened in 1993 when he released his first solo album. The album topped that year’s best of melodic rock charts and had an impact all over the world – but especially in Japan. Later on, four more solo albums saw the light of day. During the last fifteen years Mikael also led his own band LAST AUTUMNS DREAM, who released 15 albums and did some touring in Japan, Germany and England. Now, Mikael Erlandsson is back with a new album filled with songs in his classic style. “Eye of the Hurricane” opens with some ominous keys and a mid-tempo guitar riff. Mikael’s voice at first is hushed and then he turns it up in the chorus with a snarly edge. “Why” has a jovial sound and cadence…sounds like good clean fun to me. The chorus adds great harmony in the vocals and the keys do a nice job of holding down the melody. “Pain” opens with a mid-tempo riff and an easy listening guitar riff. The chorus is full on, and like any good rocker, it gets your blood pumping. “Evil” opens with a little faster of a sound and a guitar riff that builds. You can really hear the bass guitar in this track which is sometimes lost in the genre. “Had to Let you Go” opens with thoughtful and melancholy piano notes and the solitary emotional vocals of Erlandsson. It’s a proto-typical “power ballad” for those of you who are old enough to remember this term. “Break Another Heart” and “find another fool” are the opening lines of this track. The chorus is subdued in keeping with the title. Keyboards usher in a nice key change after the half-way mark. “Fear the People” opens with a tough and somewhat heavy guitar riff complete with keys in the background. It still has that dragging mid-temp pace which isn’t overly mitigated with a bombastic chorus so it suffers a bit here. “OK” is just a faster and easy listening song with some basics that tell the listener that everything is OK. There’s a nice balance of guitar and keys here and some well-placed “oohs” in the chorus. This would make a nice single. “I Just Wanna Love Ya” is another power-ballad, with tender opening vocals and piano. It’s emotional and expressive with a nice guitar solo that bleeds with the music. “Alice in Wonderland” is an odd song, unlike the others on the album. It has a weird chord progression and makes you feel like that’s where you might be heading. Overall, this is a strong collection of songs but none really stood out besides “OK.” It was fun and easy to listen to, but just lacked that big punch that you can often hear in the AOR genre. Clearly, Mikael has a great voice but just wasn’t able to get the album off the ground too far.